I was a reluctant camper as a child. Bugs, rain, sleeping on the ground – not really my scene. On my return from my first guide camp I sat on the bathroom floor sobbing as ants marched out of my rucksack, begging my parents to never never let me do anything so utterly wretched ever ever again. To their very great credit, they managed not to laugh. But even I had to admit, the bit where we burned marshmallows was pretty fun. There’s nothing quite like poking a marshmallow onto a stick and holding it in the fire until it burns bright blue and the surface turns caramelized and sticky. Nothing that beats the satisfaction of the perfect toasted-ness – caught just moments before the little pillows of fire melt like Dali clocks, and run, dripping into the fire, then fall, lost forever to the flames. But neither of us had eaten a s’more until we came to America. But I get it, more than get it. The sandwich aspect, which I love, the chocolate – all good. The only downside, really is that if you live in a New York apartment, you probably shouldn’t suggest making s’mores for a party on the rings of your kitchen gas burner, unless you enjoy scraping molten marshmallow off the stove late into the night. 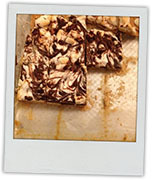 These s’more bars are a tame urban compromise – but they’re so delicious that it’s impossible to care. You start with a cracker (biscuit) base, cover it with rich toffee, top with mini marshmallows, toast in the oven (I know, cheating, the oven), then top with chocolate. 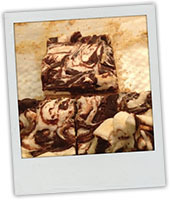 This gooey layer of deliciousness sets into a cake bar something along the lines of millionaires shortbread. Totally moreish, prefect for a picnic, a big hit at the 4th July party I went to where we were asked to put out a citronella candle, so flaming marshmallows would have been right off the agenda. This recipe makes about a half sheet pan of bars – I cut them into square inch ish chunks, which was enough for a 4th July party of 8 with leftovers. This recipe is adapted from one that I found last year on Chow – check it out here. I go for a thicker caramel layer, more chocolate and broiling rather than baking. Their version also includes pecans, which I love, but Jon loves less, so this more traditional s’more is what I go with. 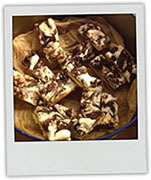 This entry was posted in The Monday Treat and tagged 4th July, baking, bbq, camping, chocolate, easy, marshmallow, picnic, s'mores, sweet treat. Bookmark the permalink. Sometimes I add some condensed milk to the caramel to get a stickier, richer texture, and I left it on the recipe by mistake – I’ve taken it off. Is that what you’re thinking of? Otherwise the quantities show up when I look at the screen – a tray full of crackers (12 ish) 1/2 cup brown sugar, 1 stick butter, 1/2 tsp salt, 1 tsp vanilla, 3 1/2 cups mini marshmallows 1 1/2 cups chocolate chips. I hope you enjoy making them – they’re being a big hit among my friends at the moment! For the uninitiated, what are “graham crackers” can they be replaced with something we can buy in England? Graham Crackers are basic plain biscuit – like a digestive, but oblong shaped.